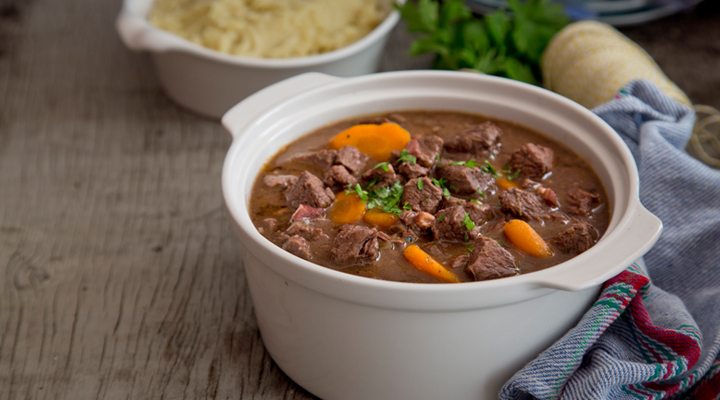 This is a classic beef stew from Provencal. I've kept the flavours quite simple to make it more family friendly, but if you like, you could add some black olives, a few tinned anchovies and even some strips of orange peel too. The key to this dish is reducing the sauce, so don't be tempted to skip it! 1. Preheat the oven to 150°C/gas mark 2. 2. Warm 1 tablespoon of olive oil in a large casserole set over a medium-high heat. Add the bacon and cook for about 5 minutes, until it’s starting to crisp up. Remove with a slotted spoon to a plate lined with kitchen paper to absorb any excess grease. 3. Add another tablespoon of olive oil if the pot looks too dry, then add the carrots, onions and celery. Reduce the heat to medium, season with salt and pepper and cook for another 5 minutes, until the vegetables are starting to brown slightly. Add the garlic and herbs and cook for 1 minute, just until the garlic is fragrant. It’s important not to burn the garlic or it will ruin the flavour of the entire dish. Stir in the tomato purée and cook for 1 minute more, then pour in the wine and beef stock, add the bacon back in and bring up to a simmer. 4. Add the beef to the casserole and give everything a good stir. Bring to the boil, then season again with salt and pepper, cover with a lid and transfer to the oven. Cook for 3 hours, until the beef is completely tender. Check on it now and then to make sure the beef is still covered with liquid and top it up with more stock or water if necessary, as the beef will become tough if it dries out. 5. Strain out the beef and vegetables with a slotted spoon into a large bowl and cover with tin foil to keep warm. Set the casserole over a high heat and bring the cooking liquid to the boil. Keep at a steady boil to reduce by half into a thick sauce. 6. Spoon some mashed potatoes into wide, shallow serving bowls and top with the beef and vegetables. Spoon over the sauce and garnish with parsley to serve.